So that was incredible right? No one, not even coach US Jurgen Klinsmann, expected the American team to win its World Cup match against Ghana. And when they did, excitement erupted in the streets and, of course, on Twitter. Delta tried to get in on the excitement with the tweet above. So, the US is the Statue of Liberty with two points and Ghana is a giraffe with one point. Well yeah, you got the score right. Except there are no giraffes in Ghana. There are giraffes in Africa. 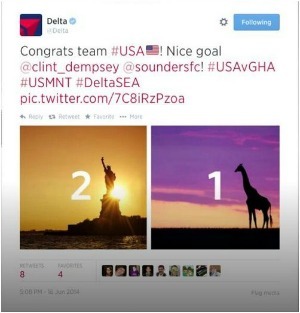 But as a major international airline, Delta ought to know that Africa is a large continent and giraffes cannot be found in all of its countries. In case they forgot, Twitter reminded them. But from there, it only got worse. 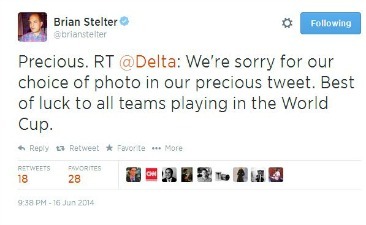 Delta tried to apologize for the image and then suffered an ill-timed typo. Ultimately, this is what they settled with. PRs: do a little homework before you get social media slap happy. It seems small, but these little details really matter.